French President Emmanuel Macron on Monday appoint im Senegalese-born media advisor as goment tok-tok pesin. Sibeth Ndiaye be one of three new ministers for im cabinet as im dey prepare for European Parliament elections next month. 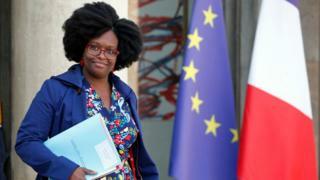 Sibeth Ndiaye, wey dey born for Dakar dey 39 years old, na for 2016 she get her French citizenship wen she work as communications advisor for Macron presidential campaign. "France don give me a lot. Today, na my turn to give something back, "Ndiaye tok dis one for her handover ceremony for Paris on Monday, She praise her papa and mama as dem help she and her sisters "break through glass ceilings". Dem born Sibeth Ndiaye for 13 December 1979 for Dakar, Senegal. Her family encourage her to join politics when she dey young. Sibeth papa, na politician with Senegalese Democratic Party, while her mama na judge for dia kontri constitutional council. Ndiaye go school for Senegal and Paris, wia she join di French national students union. She say di reason why she put eye for national politics na because of di 2002 French presidential election, wia far-right National Front Jean-Marie Le Pen make am to second round. She join di Socialist wia she begin her career for politics. Na 2014 she first meet oga Macron when im be deputy secretary general for Elysee, and she bin dey work for di economy minister. When im declare im presidential ambition, she join im campaign team. Dat decision na im make her become media advisor to di President of di Republic. She go replace Benjamin Griveaux, wey resign last month to prepare to run for mayor of Paris next year. Mamoudou Gassama: Who be di Mali 'Spiderman' Paris hero?